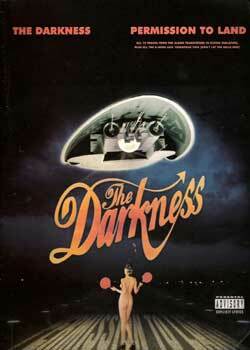 The Darkness Permission to Land PDF download. The greatest guitar tab for the greatest album by the greatest band in the world ever! The debut album Permission to Land has gone four times platinum in the United Kingdom, and the album folio is the fastest-selling in the history of the U.K. This folio includes five pages of color photography, detailed explanations of how to read the tabs. This is a sheet music booklet including the guitar tablature and notes to every song on the album plus the Christmas hit ‘Christmas time (Don’t let the bells end)’ and others featured on some of their singles, like the live favourite ‘Best of me’. Sometimes the beats of some notes are not fully correct or are just a little misleading and solo/bridge tablature can be over-complicated and difficult to follow. But the rate of their chords, riffs etc are of top class and there is a great deal of variety. Learning songs simply needs effort, concentration and enthusiasm due to the standard the Darkness brothers play at, but I would recommend it to anyone that can pick up a guitar and play because this can rarely be closely compared with other sheet music. Download The Darkness – Permission to Land PDF free and other books from our site. Only high quality PDF scans. Please write a review, it's important for our community.